"He said he just kept saying to himself, 'I'm not going out like this. This is not going to be the end of my story'"
Gregory Eubanks went out for food on Friday night and then disappeared. His family called his phone over and over, but it went straight to voicemail. They searched for his car. They filed a missing persons report. But there was still no sign of him. 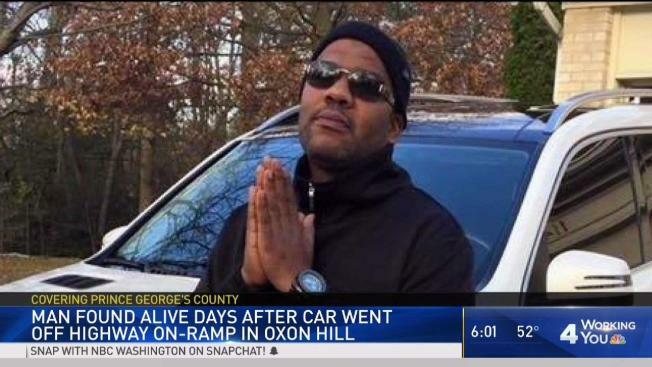 Two days later, the 41-year-old was found outside his smashed van down an embankment in Prince George's County. After Eubanks was thrown from the vehicle, he survived for two days by drinking rainwater, his relieved family told News4. "He said he just kept saying to himself, 'I'm not going out like this. This is not going to be the end of my story,'" Eubanks' cousin Tre Drew said. It appears that Eubanks' white Mercedes crashed down an embankment on Indian Head Highway (Route 210) near the Capital Beltway. Eubanks was thrown from the van and broke multiple bones, including in his back and his shoulders, his family said. "He could barely move," Alicia Powell, his sister, said. Temperatures soared to the mid 80s, and then heavy rains drenched the area. Eubanks went into "survival mode," said his brother, Deon Greene. "He was laying down there in a ravine, and he had to sip water from out the puddle to survive," Greene said. "What he was telling me was just terrifying." Eubanks tried to cry out, but no one could hear him over the noise of the road. Finally, before 8 a.m. Monday, Maryland highway workers spotted the white Mercedes. They saw Eubanks, and he was rushed to a hospital in stable condition. He was recovering Monday evening. "I'm just glad he's alive," said the victim's son, Gregory Eubanks Jr.
"I know that's nothing but God. God saved my dad," he continued. A photo of Eubanks shows his hands clasped in prayer. Maryland State Police are investigating the cause of the crash. CORRECTION (April 16, 2018, 12:15 p.m. ET): Prince George's County fire officials have clarified that the victim was found outside the vehicle, not inside as indicated by other officials.